Former Nigerian President, Chief Olusegun Obasanjo, has said rather than limit women to the 'other room,' there should be a deliberate effort to maximise their potential to make meaningful progress in African counties. Emphasising that until women play greater roles in politics, they would continue to be shortchanged,. The former president lamented that out of the 360 seats available in the House of Representatives, only 15 were occupied by women. According to Obasanjo, "For any country, it will be unfortunate if 50 per cent; in our own case, 52 per cent, of our population are not given what they need to make meaningful contributions to the economic and social lives of the country. Then, that country will not make the progress that it should make. "And the beginning is education, acquisition of skills, empowerment and giving women their rightful place in the board room; not just in the other room," he added. Noting that Rwanda and South Africa have 64 and 41 per cent women representations in their respective National Assemblies, he said: "Here we have 36 states but we have not gotten a woman who has been governor". "The one that got voted, the men made sure she was removed. I agree that the education of a girl child is important, but we won't get there until our women take their place in politics, because we live in a male chauvinism world. They are your father, brother, husband and cousins. We must have them to do what they should do. "When I was elected president and I had to appoint ministers, they didn't include women, but I had a retreat and saw the brilliance of the women. I saw their performances and it was among them that I picked nine," Obasanjo said. 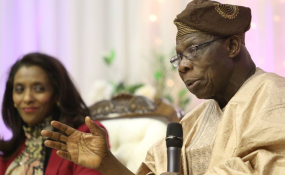 Obasanjo said all cultural and religious values responsible for retarding women emancipation must be pulled out of the country's way of life so as to harness their full potentials. He advised that rather than relying on only themselves to bring about the needed change of attitude towards their development, women must ensure that the male folk were part of the drive, saying: "If everything fails, use pillow talks, arguments and persuasion. There is limit to how long they can go without you. You may have to go on strike because they will not give it to you. You have to extract it from them," he added. Earlier in her keynote address, former president, Republic of Mauritius, Prof. Ameenah Gurib-Fakim, had harped on the need for women to encourage each other, get education and get actively involved in economic activities. "Women tend to discourage other women and that is the tragedy. How do we build a critical mass? One of this is through education. Education is the most powerful weapon to change our situation. Educating a woman is educating a family. To those without education, the future is bleak," he added. Daughter of the late military head of state and convener, MMF, Mrs. Aisha Muhammed-Oyebode, on her part said though women had demonstrated tremendous capacity to contribute to the development of every facet of society.